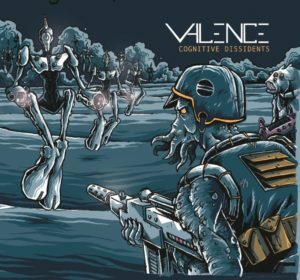 New York-based progressive metal fusion quartet VALENCE recently announced the release of their upcoming album, Cognitive Dissidents, out April 12, 2019. Expertly fusing genres like metal, rock, jam, classical, jazz, and more, VALENCE‘s varied yet cohesive influences offer every listener a passport to a new state of mind that is cerebral and emotive, while not sacrificing accessibility. Today, following up on the release of their latest jam “Damnit, Lana!”, VALENCE have dropped a full band playthrough of their ridiculous new track “Preferred Nomenclature”. Prepare yourself and witness the insanity via Gear Gods now. VALENCE wastes no time in launching Cognitive Dissidents intro the stratosphere with lead single “Damnit, Lana!”, setting the course for what is about to be one hell of a ride. Rock technicality blends into a seductive Latin fusion-inspiredsection driven by multi-talented percussionist Chris Romano, only to finish as an unrelenting metal opus. “II. Calmer Than You Are” shows the softer side of VALENCE, illustrating a synth-laden soundscape led by bassist Wilhelmus Sapanaro. The band continue to flex their tech-muscles on tracks like “III. Preferred Nomenclature”, in which guitarists Michael Buonanno and Geoffrey Schaefer burn through over five minutes of deft ebb and flow – fluxing between absolute mano-a-mano, battle-like shreddery, deep grooves and classically-influenced passages. “Walrus”, amid its journey, provides an unexpected mid-track jam trip before the album closes with “Red Sky at Morning” – a 14+ minute sonic escapade that can only be described as positively monumental.